The exhibition will be open to the public and run daily from Saturday 20th December until Tuesday 23rd December. ‘Bigger than God’ is a group show, featuring selected bodies of work from Harry Borden, Ian Davies, Grant Fleming, Chris Floyd, Pat Pope and Graeme Robertson, all works are curated by theprintspace team. theprintspace are proud to present ‘Bigger Than God’! theprintspace are pleased to announce the opening of a new music photography exhibition featuring the works of a carefully selected roster of some of the UK’s finest photographic artists, entitled ‘Bigger than God’. The exhibition includes the unique and candid viewpoints of photographers and close friends who toured with the bands and who were given unfettered access and shared intimate moments where the artists are seen, unusually, not embodying their ‘mythical’ or ‘god-like’ stage personas. 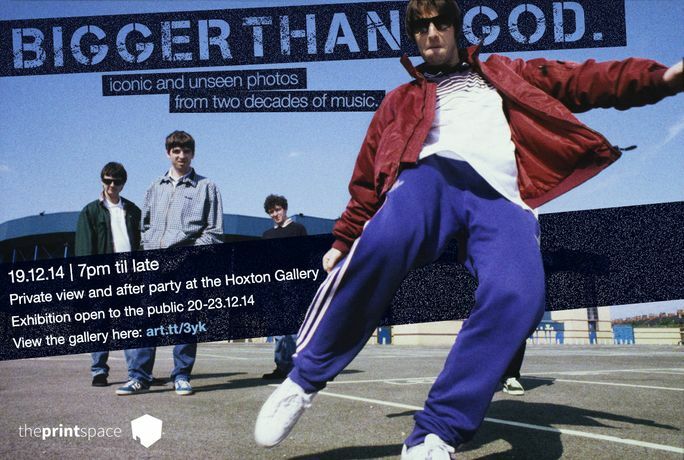 Captured over the last two decades of Britpop, Hip-Hop, Dance and Rock, the exhibition features familiar and iconic shots as well as many previously unseen images. The show will feature a diverse mix of styles ranging from studio to reportage, all of which will be exhibited at the Hoxton Gallery. For the month of December only, fine art archival prints will also be available through thehub, an innovative new cloud-based application from theprintspace that enables artists to sell fine art photography online. The private view and after-party will be on Friday 19th December from 7pm – late at The Hoxton Gallery. Refreshments and tunes will be provided. Admission is, as always, free!